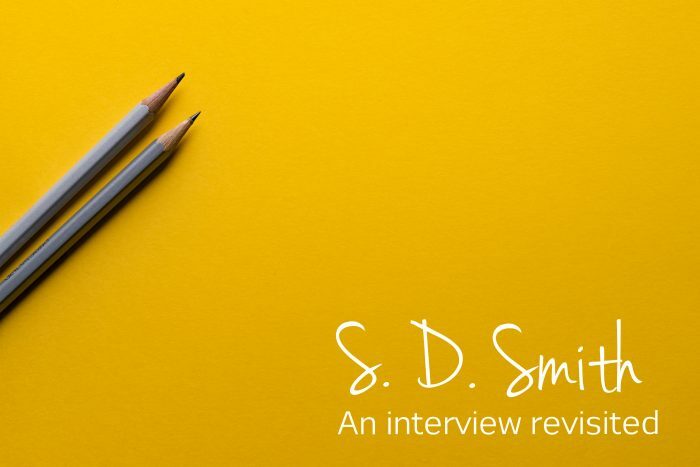 Back in 2015, I had the extraordinary experience of being able to interview S. D. Smith, the author of The Green Ember and The Black Star of Kingston. Since then, Mr. Smith has published three more books, and Ember Rising is now my favorite in his series. Thinking over how expansive The Green Ember series has grown to be, I decided it was time for an article update! His books are not only full of risk and suspense, but also loyalty, pluck, and sacrifice. I enjoy the courage of his characters, the plot turns he takes readers on, and the world he has created from scratch. Everyone, from ten years on up, should give these books a read! I’ve left comments in the interview to give you an update on what happened after 2015, but otherwise, the interview is in it’s original, shiny form. When did you get your inspiration for The Green Ember? The Green Ember started as some stories I used to tell my daughter. We live in rural West Virginia and have a lot rabbits, deer, and other animals around our house—we even saw a bear the other day. I used to tell Anne stories about those rabbits we saw hopping around in our yard. When she was little, the stories were about a little girl rabbit. They were really simple and innocent. When Anne’s brother, Josiah, came along, a boy rabbit came, too. As the kids got older, the stories developed more peril and danger, and higher stakes. We used to call it The Rabbits At Jupiter’s Crossing. We told the stories at bedtime, or on walks. Originally, the rabbit’s names were Hannah and Joe, based off of Anne and Josiah’s names—since the stories were for them. The Rabbits At Jupiter’s Crossing started early on. My kids always encouraged me to write it down. I wanted to, and eventually I began to write it. While the ending was always known to me, the whole element of the Mended Wood came as I wrote. Some people who read The Green Ember think that the Mended Wood was the part I most intentionally planned out. But that part just came to me. I was trying to think what would make a good story and what would be likely to happen in the world where Heather and Picket lived. The element of anticipating a new world is true. Our family is focused on anticipating the kingdom of God. I wasn’t trying to preach or teach; I thought it was an authentic occurrence. When I finished the book, I gave it to my kids to read. They gave me a lot of feedback. I feel like the story belongs to our kids—it belongs to our family. And we feel like it’s something we love and enjoy. It’s for our kids, and it’s our story. We feel like that in itself is enough. But as I wrote it out, we decided that we wanted to share it. It’s almost like a meal we’ve created and want to share. We think it’s good, and that’s why we want to share it—we wouldn’t share it if we thought it was bad. We want to share what we love with others. We grew up in the “holler” of the hills in West Virginia. It probably started when my mom would read us The Chronicles of Narnia when we were little. That’s really what started my longing for beauty and goodness and truth. My imagination was beginning to apprehend danger, beauty, and glory. Those are things that I feel like I understand more fully now that I’m an adult, yet still feel like a child in many ways. That awakened something in me that I guess I’ve never gotten over. I was not a kid who read a lot. In first grade, our teacher read us Lassie and The Boxcar Children, and I started writing little dog stories. None of the boys I knew read, and I didn’t really know any men who read. My dad read the Bible and some theology books, but I didn’t know any men who read fiction. None of my peers and none of the men I knew read. So I stopped reading. I wouldn’t say that all of that awaking died. It was kind of like hibernating. In my late teens, I had a period of time where I began to be really focused on the Lord and the Bible. I had a real passion for Jesus, and started reading the Bible all the time. Out of that, I started to read some other books, like The Hobbit and Lord of the Rings. The glories in the books were something I couldn’t let sit. That kind of re-awakened the longing. I went from there and discovered Shakespeare, which I read when I lived in South Africa. Your books seem to explore the theme of loyalty in contrast to self-loyalty, or selfishness. Any thoughts you’d like to share about that? What I really wanted to do was write stories that reflected the big reality of the world in small ways. Tolkien talked about the Lord of the Rings as being a true story, because it was faithful to how the world really is. I always wanted to write a book that was true to reality. I’ve always been really tuned into loyalty in books. That’s part of my history and culture here. I’ve always just loved statements of loyalty. Everyone always condemns Thomas for his doubting. We forget that when Jesus turned to go to Jerusalem, where the disciples knew He would be killed, Thomas said, “Let us go there also, that we may die there with him.” I’ve always loved that kind of thing. I wanted the story to reflect the tensions between tyranny and liberty. Liberty being not an escape from order or from law, but a proper oriented person under good and sacrificial authority. I wanted it to reflect people who are complex, with the fallen nature in leadership. In my books, the bad are sort of blanket “bad.” But every person has some measure of good and bad in them, because of sin nature. I wanted the big picture to reflect reality. I wanted more than big sword fights and battles. We all have an inner war going on. Picket’s struggle with bitterness is an example. There’s sort of a delicious nature to misery and to focusing on our slights. I just wanted to tell a truthful story about the way God made the world. I feel like Christianity is a comprehensive way to tell truthful stories. In some other religions, Man is either a noble creature, or is completely awful. Christianity accounts for both sides. Man is noble, and there is true beauty in that. But we are also capable of incredible inhumanity. I wanted Picket and Heather’s struggle to reflect reality. I wanted those inner battles to be as meaningful as the big battles for the world. I feel like those battles are related. Picket has to win the battle inside and confront his weakness before he can answer the call to do the more important, big-scale heroics. I am working on book two right now pretty hard. I want to tell a few more rabbit stories. I’m trying to think about what my next steps are in some ways, without it dominating my experience right now. I’ve got a full-time job and a family. I don’t have a lot of time for the writing world. But I’ve been given a lot, and I’m grateful. Update: Book two, Ember Falls, was published in 2016. In 2017, S.D. Smith became a full-time author! Think about the scenes in the beginning, middle, and end. Don’t think “this happened, then this happened,” but “this happened because that happened.” If you want to have a certain scene, it needs to be related to the others. You want the stakes to be high and to be building layers. It pushes the readers along. Nobody likes a story where the stakes are low. There has to be conflict. Stories are interesting when there’s conflict, danger, evil, and an enemy. Something’s got to happen and to matter. Character motivations are also really important. “Why does this character care?” In the Lord of the Rings movies, Peter Jackson left off a really long section – a falling action section. It made sense with the movie to cut this part out – the battle, the main event, was done. But in the book, Tolkien did more than that. By ending with the long section, he resolved the character story in a satisfying way. We’re able to access the magnificent world of elves and battles because we’re on an adventure with ordinary, rural hobbits. We go through the story with them. When the main event is done, Tolkien tells the story about the characters coming home. They’re different than before, and it’s obvious to the reader. Tell character stories. You talked about my book as a cliffhanger. When you read the last sentence, you may be wondering, “what’s Picket doing?” The last sentence has the main character strapping on his sword. It seems more like a beginning. The book wasn’t an ending for events, but for Picket’s character. He’s different in a significant way. The characters have moved. Be mindful of the arc of the characters. Readers want characters who fail. With spectacular failure. You want the characters to have room to grow and learn. How is the character different? Not just “they won the battle,” but “what kind of a person are they?” That’s what we want in our life stories. We want to move to greater maturity, and that almost always only happens through pain. Awesome! I recently was given the first two Green Ember books, and they are really good stories. Beatifully written too. I listened to a creative writing podcast by him, the tips were really good. I think my favorite character is Picket. That’s so cool! I’m glad you’ve read them! (You should definitely check out Ember Rising. It’s so good!) Picket is an intriguing, relatable character! I think Heather is my favorite. She’s so unassuming and courageous. I loved his comment about finishing whatever it is you are writing! So many people I’ve met who wanted to be writers could not finish their projects/books. You are a great writer and have a future in this field because you can finish what you’ve started!